This is a very good .223 ammo for high precision work on game and in tactical scenarios that doesn’t mimic the ultra-premium price points of some of the other offerings from top tier producers. 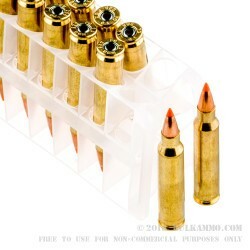 That doesn’t mean this ammunition is cheap however – it is a specialty round that’s made from very high-end components. The 55 grain Nosler Ballistic tipped projectile is a super-efficient projectile that sheds wind well and contributes to even expansion and a high diameter wound channel. 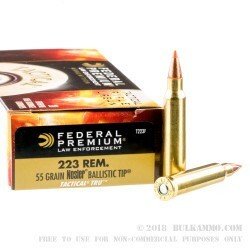 Made initially as a varmint projectile, this is easily transferred for use as a tactical round where a 55 grain projectile is deemed an efficient grain weight for the platform (.223/224). 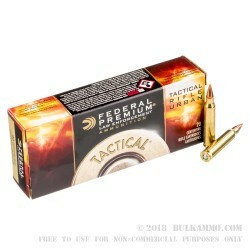 The Federal Premium Line is truly a spectacular example of what can be accomplished when a large company focuses on quality control and has a good set of factory protocols in place to ensure that ammunition is produced correctly and with attention to detail. 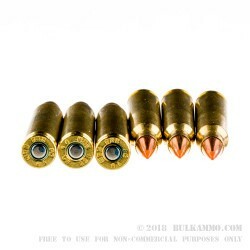 From a ballistics perspective, this round achieves the following numbers at the bore: 3220 feet per second of muzzle velocity and 1265 ft. lbs. energy. The TRU designation stands for Tactical Rifle Urban and denotes the specifications that make it good for CQB type tactical needs.